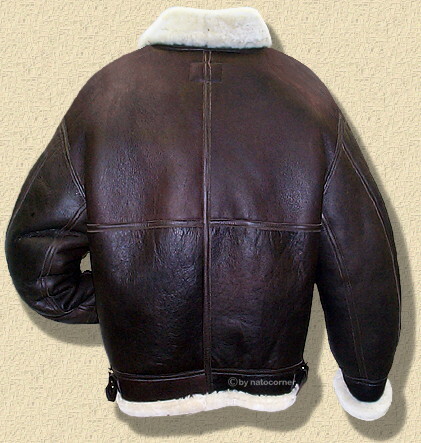 The B3 flight jacket originares in the beginning of the 40´s. extreme sub-sero temperatures occured in the unheated cockpits and flight-decks of B-17s and B-24s. Therefore the Air-Force needed corresponding clothing for pilots and flight-crews. and absolutely insensitive at the same time. On the other hand production of this clothing had to be as easy as possible and the apparel should be easy to repair. 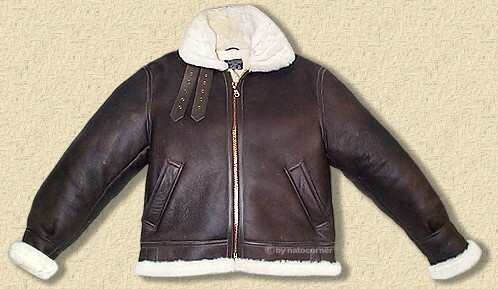 This was the birthday of the B3-lambskin, or else wether skin jacket, which immediately became a popular object with army members, and is still very popular nowadays. 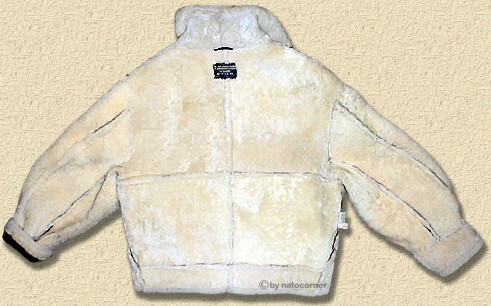 The appearance of this jacket will become better each time you will use it. ­but memories will be visible for ever. "no cowhide leather accents" -no tittle tattle. 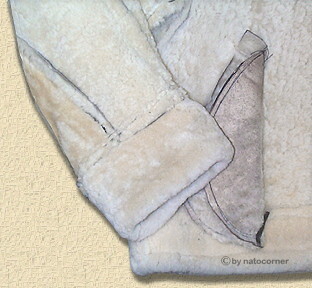 How with the original the inner side of the jacket is the sheeps outside and the outer skin is "close to the steaks". After sewing the single cuts of the skin, the seams are additionally reinforced and taped by leather strapes -for rugged duty and waterproof seams. 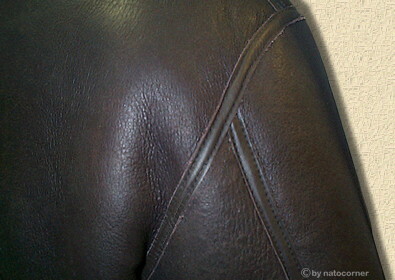 The inlet pockets are made out of the same leather. The turn up collar can be closed draughtproof due to dual leather adjusters with solid buckles. 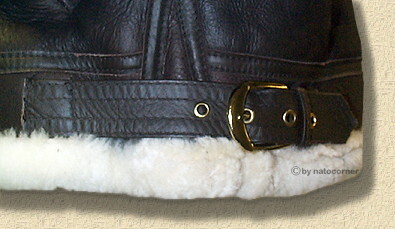 On each side buckle straps are attached to adjust the broadened waist. 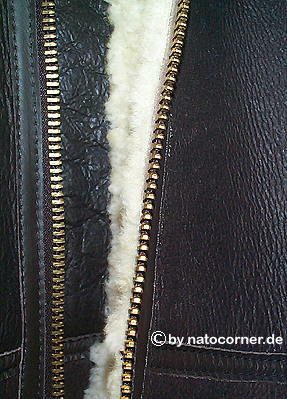 The XL-size zipper, an innovation in former times, is also made out of solid brass material. 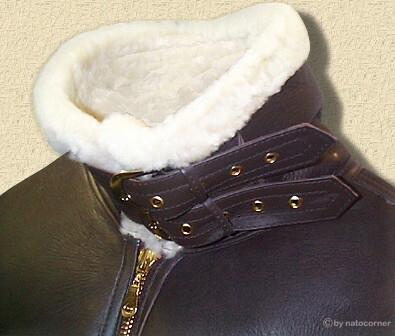 The zipper is strengthened by a leather binding and sealed up by a storm flap. It is absolutely insensitive and also the fur hardly takes up any dirt. 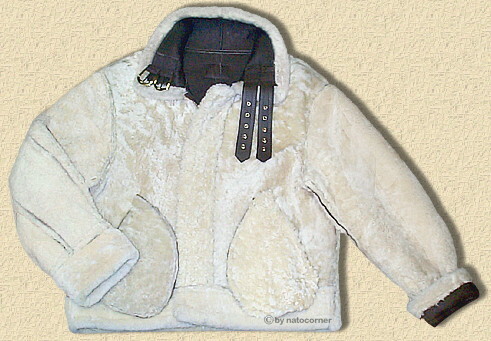 In fact, jackets of dry leather can absorbe up to one kilogram dubbin.